This still shows the hand of Billy Chi, a versatile, American based guitarist who owns a popular YouTube Channel where he uploads instructional video’s. In the video from which the still was taken Billy Chi teaches you in 60 seconds how to play Despacito from Luis Fonsi. To be honest I had never heard of Luis Fonsi but I noticed that Billy Chi plays on a guitar made by me. But for the ones interested in playing Despacito, herewith Billy’s instructions as well as the original version. These are Thomas Offerman and Predrag Stankovic. 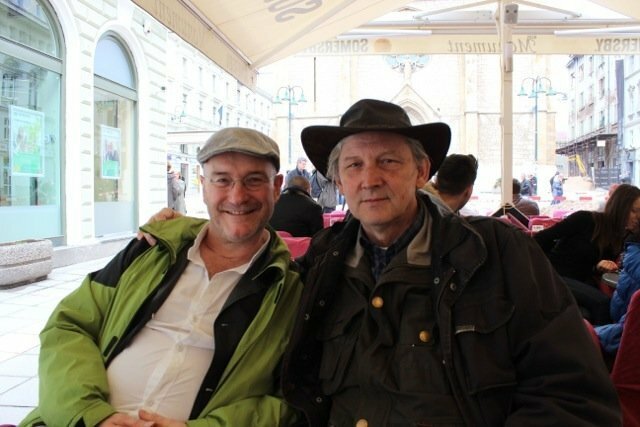 The picture is taken at the Sarajevo International Guitar Festival for which I was invited by Đani Šehu, the founder of the festival. Thomas is professor in Rostock and also teaches in Berlin, he wrote a dissertation about guitar technique and works as a director of guitar ensembles. He is giving masterclasses at the festival. Predrag is a sought after guitar teacher who works at the music school in Tuzla. His (former) students won over fifty international competitions. He is visiting the festival to see how the ones taking part in this competition are doing. Jacob Vlijm is teaching classical guitar at the ArtEZ School of Music in Zwolle where he once was a student himself. His teacher was Pieter van der Staak, a Dutch guitarist / composer who in 1968 initiated the first classical guitar festival ever. The festival still exists and since 2007 Jacob Vlijm is the director. Next edition is called Adultery and starts at October 26. This is Kuang Junhong. 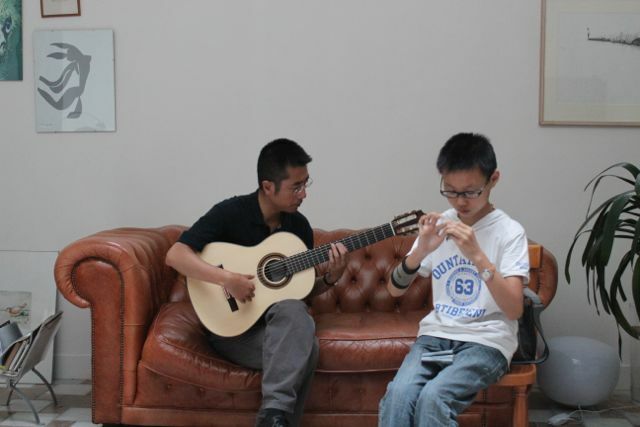 He is twelve years old and dropped by with his teacher Xu Bao, head of the Guitar Department of the Sichuan Conservatory of Music in Chengdu. They were on their way home after having visited Guitar Symposium Iserlohn. Kuang Junhong had taken part in the competition were he became fourth. For the best interpretation of Spanish music he won the First Prize. 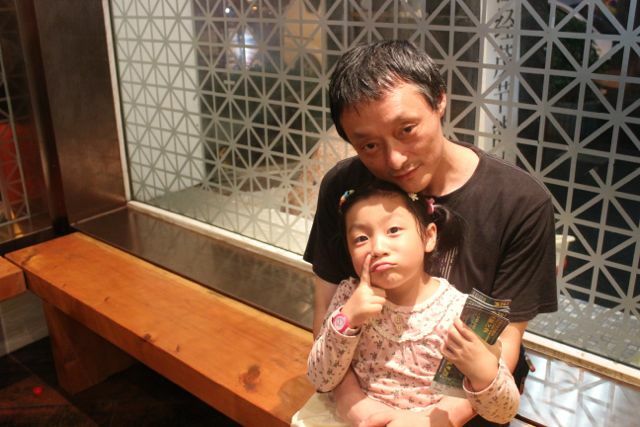 This is Li Le with his daughter Li Mu Xin. Li Le is aircraft engineer en teaches aeronautics at the Zhejiang University. He is also the owner of a music school in the centre of Hangzhou. More than three hundred guitar students are attending the school and many of them play my 2A model. Every Friday night the students and teachers meet at the school. They play the guitar, discus attended concerts and CDs they listened to. Little Li Mu Xin also plays the guitar. She can be admired at Youku, the Chinese version of Youtube, where she plays Prelude BWV 1007, from the first cello suite by Johann Sebastian Bach. This is Alfredo Huang, a Taiwanese guitarist who I met years ago, during my first visit to Taiwan. He is a very active player who works as a soloist as well as an accompanist, mainly of the Korean soprano Ko Suk-Kyung, his wife and former fellow student at the Real Conservatorio de Madrid. Besides as a performer, Alfredo is also very much appreciated as a professor. He regularly shows videos of his students on the internet like this, of a guitar quartet of which all members are playing my instruments.